As the days shorten and the colours of autumn fade, you might think it’s time to stop going to visit gardens, but many of them are using this time of year to add a completely different element to the plants by using lighting. Up-lighting, down-lighting and adding both sculptural and moving lights, with or without accompanying music gives these gardens a magical feel and makes you look at the plants in a completely new light (forgive the pun!). 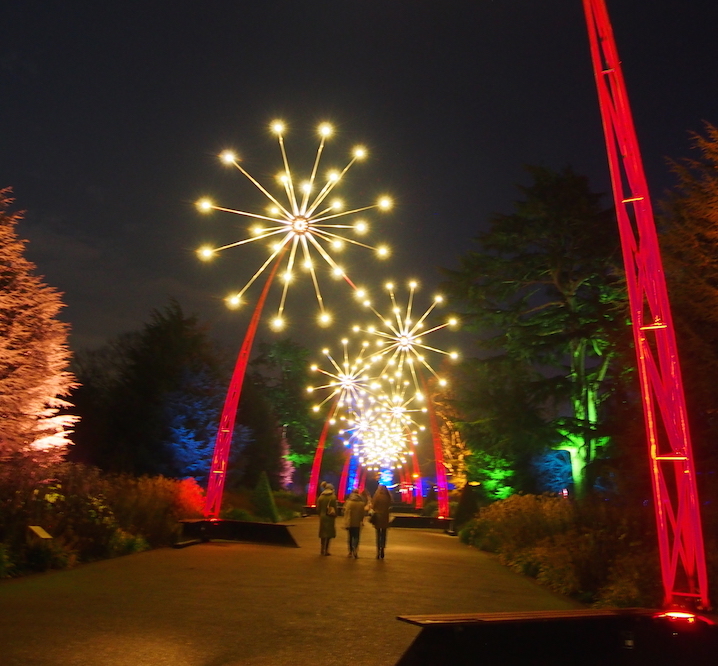 The Royal Horticultural Society have light installations at their gardens this winter. They are running Glow 18 at their garden at Wisley, Surrey until 2nd January with illuminated trees, light installations and floating lights. There is also a seasonal display in the Glasshouse, with elves and reindeer to find. At RHS Harlow Carr, Harrogate there is an illuminated trail around the trees and lake until 29th December. Waddeston Manor, Buckinghamshire has Enchanted Menagerie displays until 2nd January with projections onto the façade of the manor itself and the National Botanic garden of Wales is transforming into a Winter Wonderland for the first time with lights, music and Yuletide treats to eat and drink. National Trust gardens are joining in, with evenings at Blickling, Norfolk, Calke Abbey, Derbyshire, Corfe Castel, Dorset, Coleton Fishacre, Devon, Dunham massey, Cheshire, Felbrigg Hall, Norfolk, Fountains Abbey, North Yorkshire, Powis Castle, Powys and Trelissick, Cornwall. Booking is essential for many of these displays, even if you are a member at the garden concerned, and all are outdoor so make sure you are well-prepared for the weather. They are well worth a visit in the run-up to Christmas and will delight the younger members of the family just as much as the older ones.